Hortus Camdenensis | Tabernaemontana dichotoma Roxb. Frost tender shrub with oblong leaves, to 12cm long, and many-flowered terminal cymes of slightly scented white flowers in autumn, followed by pendulous, orange-yellow fruit, with a depression on one side. To 2m. [RHSD]. ‘A most fragrant and beautiful stove plant, resembling a Plumieria in appearance. It is a native of Ceylon, whence we possess native specimens; according to Dr. Wallich it also occurs in Malabar. The latter describes it as a plant which grows from 12-16 feet high, with a peculiarly dark and glossy foliage, and delightfully fragrant flowers. It quite merits the character it has received, as appeared by the specimen at Sion house, from which the accompanying figure was made by permission of His Grace the Duke of Northumberland. 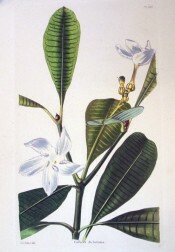 […] The Sages of Ceylon having demonstrated, as they say, that Paradise was in that island, and having therefore found it necessary to point out the forbidden fruit of the garden of Eden, assure us that it was borne by a species of this genus, the Divi Ladner of their country, and probably the plant before us. The proof they find of this discovery consists in the beauty of the fruit, said to be tempting, in the fragrance of the flower, and in its still bearing the marks of the teeth of Eve. Till that offence was committed, which brought misery on man, we are assured that the fruit was delicious: but from that time forward it became poisonous, as it now remains.’ [BR f.53/1841]. Introduced to Britain in 1820. [JD]. LBC no.1516/1829. The only record is a handwritten entry in an 1850 catalogue held at the Mitchell Library and inscribed on the front Wm. Macarthur 23rd Dec. 1854. [ML 635.9m]. This is good evidence that it was grown in the gardens at this time although it didn’t appear in the 1857 edition of the catalogues. Tabernaemontana dichotima Sessé & Moc. is a Mexican species described in 1893.